I’m starting to think that this mobile ecosystem that we play in every day has matured. I say that because I haven’t dramatically changed the way I use my phone from 2014 to 2015. I still use many of the same apps as I did last year (most can be found in this list), though some have improved greatly and a few have been replaced. I don’t know that that’s a bad thing, I think it just shows that it’s become harder and harder to standout with new apps or services. Or maybe people aren’t even attempting to make new products or services because the standard options are so good? Whatever the case may be, I do feel as though I’m more efficient than ever and am also able to accomplish more with the apps I continue to use on a regular basis. So that’s a good thing. In this post, I thought I would share those apps that I continued and/or started to use in 2015. I’ve found a pretty good groove this year in terms of getting the most out of my smartphone and these apps all seem to be aiding in that. These are my favorite Android apps of 2015. A lot of you want nothing to do with this app and I get why – it’s kind of crazy different than most email apps. That just happens to be what I love about it. I use Inbox for so much. It allows me to easily push emails to later dates, set instant reminders for some, create stand-alone reminders that work across Google, pin important items, and answer some emails without ever typing a word. It also smartly bundles all of my trip emails together for quick access when I’m traveling and maybe more importantly, lets me crush all of my morning inbox in a matter of seconds thanks to bundles of PR garbage that arrive each and every day. Inbox is awesome. It makes this list because I couldn’t really start using it full-time until February of this year when Google opened it up to Google for Work accounts. Up until that point, I was using both Gmail and Inbox, but the minute Google gave Gapps support, I ditched Gmail for good. I haven’t even considered returning, either, which is something I never thought would happen. Inbox is the exact type of forward thinking, productivity-focused, email app that I needed and I don’t see any reason to ditch it. If there is an award for biggest game-changer on Android, it might be Samsung Pay. While mobile payment solutions are a dime a dozen these days, this is the only one that does something different. Well, not just different, but does something all other payment apps should be envious of and that’s Magnetic Secure Transmission (MST). With Samsung Pay, you can walk into almost any retailer and pay using your Galaxy phone. It doesn’t have to be outfitted with an NFC terminal; all you need is a credit card swiper and a new Galaxy phone from 2015 and you can pay. With MST, Samsung Pay emulates a credit card swipe, allowing you to pay almost anywhere. This is the first step towards society being able to ditch physical credit cards. Forget what Apple and Google are doing with their payment solutions, because it’ll be years and years and years before we get NFC terminals everywhere. Unfortunately, Samsung Pay only works with four phones at the moment (Galaxy S6, S6 Edge, S6 Edge+, and Note 5) and a pretty limited number of credit cards. I was fortunate enough to meet all of the requirements and had at least a couple of moments where I walked up to a cashier who tried to tell me I couldn’t pay using my phone because they “Didn’t have that thing here.” Of course, their mind was a bit blown when my phone worked anyway. This year, Google gave us their new Photos app. It’s f*cking awesome. Not only do you get unlimited storage for life, a slick UI, auto-awesome for photos (including animations), and availability on all platforms, but Google keeps adding incredibly useful features to it, like rediscovering photos from years ago and creating quick shared albums that others can join and add to. My whole family and anyone else I talk to about mobile photos has been turned onto this service by me. It’s too good to not recommend over and over again. If you aren’t using Google Photos, you probably should be. Tapet isn’t a new app at all, but thanks to some updates that were pushed this year, this has become my go-to wallpaper app on most days. It’s so cool and so addicting that you could spend hours on it creating wallpapers, saving them, applying them, and then doing it all over again. We’re big into customization here, but this sort of takes all of that to a new level. 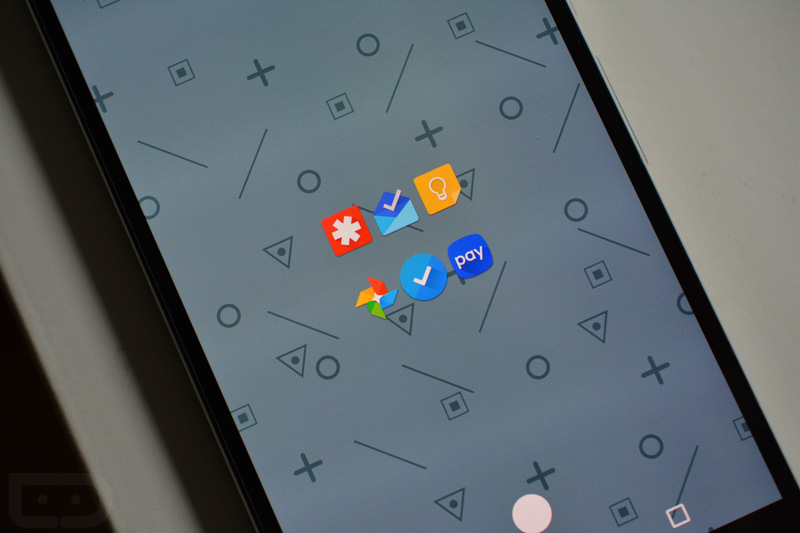 With Tapet, you get to automatically create wallpaper after wallpaper with the touch of a button. They all adhere to Google’s Material Design styles, but you can also limit the output to feature colors and designs that fit your taste. It works with Muzei, is all generated on phone (no internet slow downloads here), gets frequent updates with new designs, and isn’t a live wallpaper (don’t worry, battery nerds). Grab this app now if you are at all a fan of wallpapers. I don’t think I could even count the number of to-do list or note taking apps on Android if you asked me to. Most are pretty good too, but I keep settling on Google Keep. Actually, I’ve just stayed with it ever since Google introduced it, even as it struggled as a bare-bones app without many features during the early days. This year, though, it got easy sharing of notes (November 2014 actually), the ability to set labels and reminders, Android Wear support, quicker note taking, and drawing! It’s that first feature that keeps me coming back. My wife and I share lists and things multiple times per week. Keep isn’t ever going to be the most robust note taking app, but it now has enough features to play with some of the big boys, while remaining minimal and quick. It also works well with other Google services, which is a big plus for someone like me. I’m actually a little ashamed to admit that I finally got into LastPass during this past year. You know what I’m now using it for the most? Setting up new phones. Why didn’t someone tell me about this before? I know that use-case isn’t exactly a reason most would use it, but it has allowed me to setup new phones in minutes rather than an hour or so because I don’t have to type out login information. Plus, with fingerprint validation support built-in, you can access your LastPass locker without having to remember your ridiculously hard LastPass master password. Sure, many will shy away from password lockers because there is always going to be an uneasiness about giving one entity control over all of your secure life, but I have found it to be a major efficiency improver on my phone. We now have to change passwords far too often with all of our online accounts because of constant threats, so a service like this that can create impossible-to-remember options that are ultra-secure, is something to consider. So there are my favorite apps of 2015. Feel free to share yours.